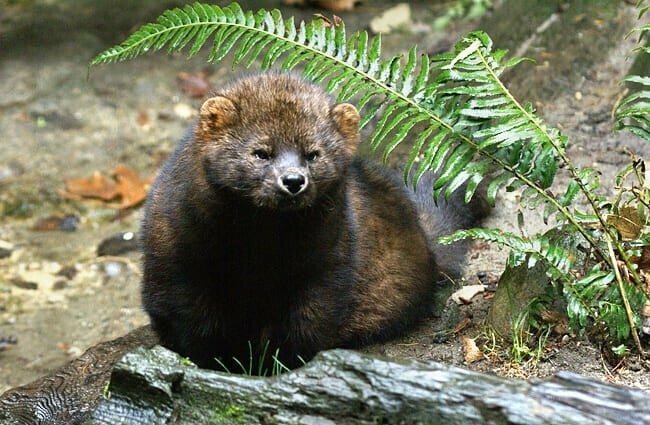 Fishers are small, cat-like mammals native to North America. 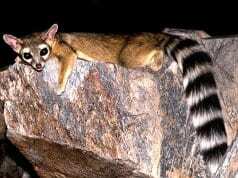 These little carnivores are not closely related to cats at all. Instead, they are members of the Mustelidae family, along with weasels, otters, wolverines, badgers, and more. 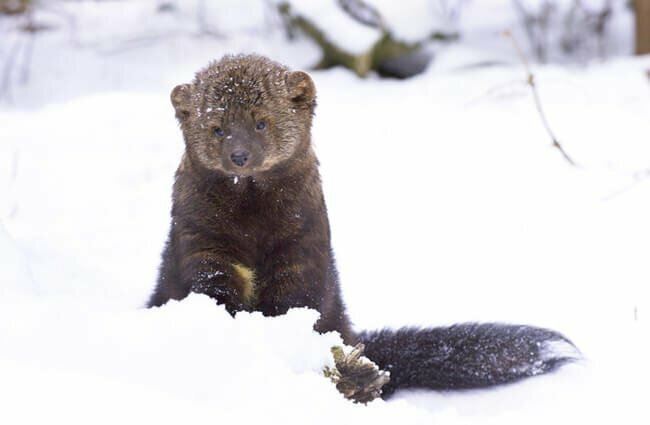 This species’ closest relative is the American marten. 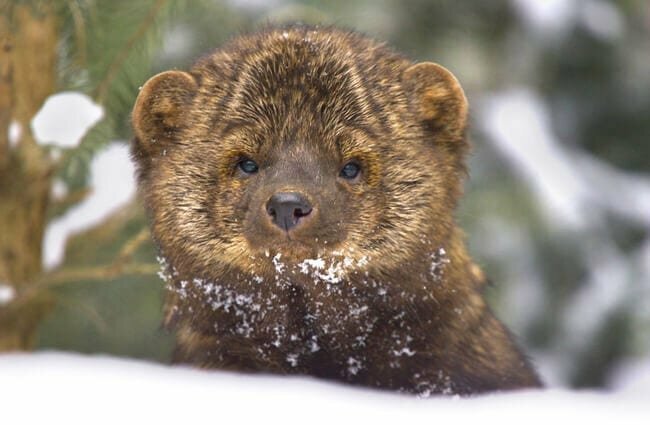 Fishers are, however, larger than martens. 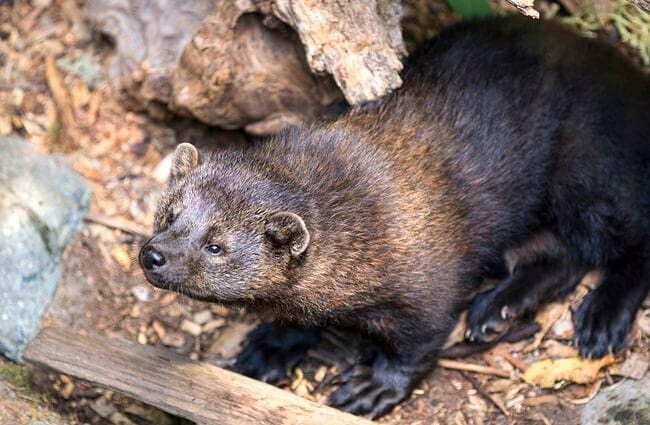 Read on to learn about the fisher. These members of the weasel family are around the size of a domestic cat. 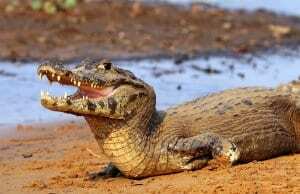 The largest individuals are nearly 4 ft. long, and weigh up to 13 lbs. or so. Like many members of the Mustelidae family, fishers have long, slender bodies with long tails. Their fur varies in color from season to season between dark and mottled brown. In the winter, their coat is dark brown or even black. 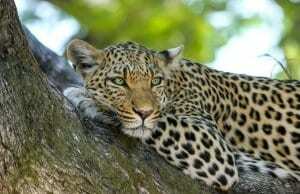 In the summer, their coat lightens in color, and can even become somewhat spotty. These predators, though somewhat small, are surprisingly fierce. They have many different adaptations to help them hunt and survive. Prickly Prey – These carnivores are one of the only species of animal that can kill a porcupine. Fishers use their speed and cunning to capture their prickly prey. Porcupine hunts can last as long as half an hour. Farmers Bane – Like many other predators, humans frequently blame fishers for dead livestock and pets. While these animals occasionally hunt chickens or ducks, it is extremely unlikely for them to attack pets. Scientists believe that pet owners blame fishers for some fatalities caused by coyotes or bobcats. 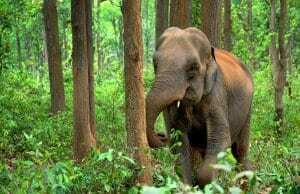 Forest Creatures – These mammals live only in areas with dense forests. In fact, they avoid forests with less than 50% tree coverage. 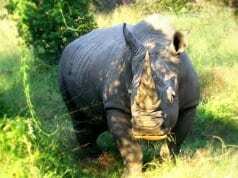 This is because these mammals must have large trees to build their dens in. The vast majority of fishers live in forests. There are a few different types of forests that fishers successfully hunt and survive in. 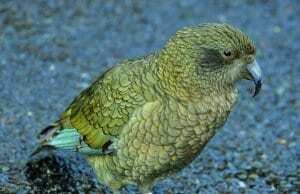 Their favorite forests are pine and cold boreal forests, but they also live in mixed forests. 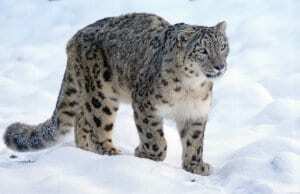 Despite the fact they live in relatively cold regions, these mammals prefer habitats without heavy snowfall. You can only find fishers in North America, as they do not live anywhere else in the world. 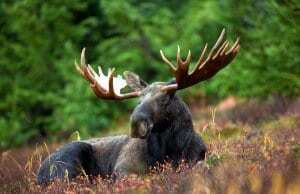 Historically, these predators roamed much of Canada and the northern United States. 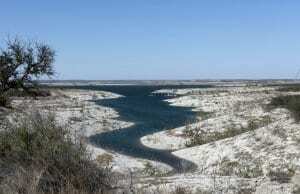 Nowadays, humans have removed them from much of their southern range. Only a small section of the northwestern United States, and the very tip of the northeastern United States, still house fishers. Fishers are absent from most of southern Canada as well. These predators are not particularly picky, and will feed on a variety of different food types. While they are carnivores, fishers will also eat nuts, seeds, berries, and mushrooms on occasion. 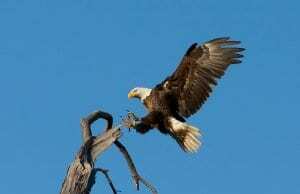 Their favorite foods are porcupines and snowshoe hares, but they also eat birds, fish, small mammals, and carrion. Fishers hunt alone, and can only kill prey that they can take down on their own. Fishers suffer sorely from human interaction across the board. Because they need to live in heavily forested areas, habitat destruction is extremely detrimental. Far worse to fishers, however, is hunting. The fur trade drove these little mammals to the brink of extinction on more than a few occasions. Any time the value of fisher pelts rose, hunting and trapping rose as well. In response, researchers recommended placing restrictions on hunting of fishers. These restrictions were relatively successful, and the IUCN considers fishers as Least Concern, though certain local populations are not out of the woods. Humans have not domesticated these little predators in any way. No, fishers do not make good pets. While they may look a little like a house cat, they are wild animals. Fishers have sharp teeth and claws, and can do a lot of damage if threatened. Zoos do not commonly keep these mustelids. Though people have attempted to raise them for fur production, these attempts were less successful than they were for minks and ermines. Perhaps the most important aspect of caring for these creatures is providing a comfortable habitat. These creatures are shy, and zookeepers have to provide them with lots of hiding places – which makes them difficult for guests to view. They will eat a diet of rodents, rabbits, and other small animals. Like other mustelids, toys, scents, and puzzles are also important for keeping these animals happy and healthy. Fishers are solitary creatures. 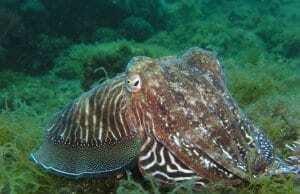 They live alone, and control several square miles of territory. As is the case with many animal species, male fishers have territories that overlap with several females. Despite this, interactions outside of breeding are minimal. Most hunting and other activity peaks at sunset and sunrise. Female fishers have a short gestation period, but delay the development of the young until conditions are right. Because of this, it takes nearly a year for the young to be born. 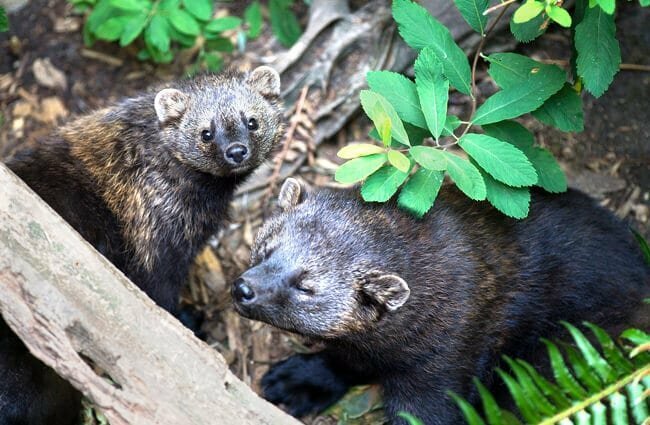 The baby fishers, called “kits,” are born around March and April. The mother fisher begins feeding the kits solid food and weaning them off milk when they are around 8 – 10 weeks old. 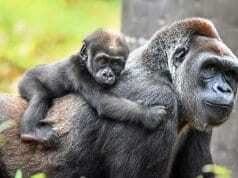 They remain with their mother until they are around 5 months old. 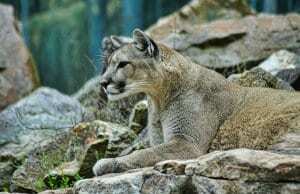 Humans, bobcats, mountain lions, etc.